The core discussion of The Framing of Sacred Space is a precise, careful, and nuanced assessment of the extant archaeological and literary evidence for the development and geographical distribution of canopies in the Byzantine world. The monograph is divided into five chapters, bookended by an introduction and conclusion. The author has included seven tables in the appendix, an extensive bibliography, five maps, and nearly 175 beautifully illustrated figures (including canopies never before published). Many appear in color and in high resolution, which is becoming increasingly rare in academic print publications. Chapter 1, “Ciborium or Canopy? Textual Evidence on Canopies in the Byzantine Church,” catalogues the myriad terms, phrases, and literary allusions to the architectural form of the canopy in medieval literature. Chapter 2, “Canopies in the Byzantine Church: Archeological and Architectural Evidence,” provides a wide-ranging survey that covers not only the eastern Mediterranean and Levant, but also key examples of canopies in Italy and the North African Maghreb. Bogdanović extends her scope beyond the immediate confines of the Byzantine church—and most notably canopies—to include an analysis of ciboria erected over saints’ tombs, shrines, icons on display, baptismal fonts, and other architectural and liturgical furnishings within, adjacent to, or even outside of more strictly defined forms of Byzantine ecclesiastical space. 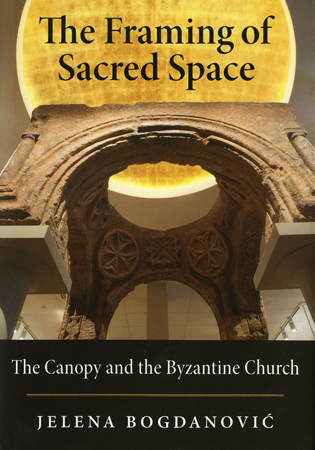 Chapter 3, “Place-Making: The Place of the Canopy in the Church,” examines the specific locations and uses of canopies in Byzantine constructions of sacred space. It is here that the author begins to craft her theoretical and theological approach to Byzantine architecture as both cosmological and, most importantly for her two final chapters, anthropological model. Chapter 4, “The Micro-Architectural Framing of Sacred Space,” continues developing this model and further explains the relationship between architectural framing devices and the Byzantine conception of the human body itself, arguing for an inextricable relationship between the divine and the human, with the canopy functioning as a threshold between the two. It is also in the chapter that the author recontextualizes the canopy as a critical link between the early Christian development of the centrally-planned church and the more modular and fluid architectural solutions of the Middle Byzantine era. She thereby effectively challenges more conventional narratives of the rise and fall of Byzantium before and after Iconoclasm that tend to overstate the influence of Hagia Sophia in Constantinople as the only legitimate archetype for understanding cross-in-square church construction. Finally, chapter 5, “Nested in Its Own Shape: The Canopy and the Byzantine Church,” concludes the study with an analysis of theological typologies in early Christian and Byzantine, as well as some western medieval, literature, most notably the Jerusalem Temple, the Holy Sepulchre, the Tabernacle and Ark of the Covenant, and the eschatological Heavenly Jerusalem, among others. The author consistently frames the discussion of these typologies with a broader analysis of the architectural forms of specific canopies, where they were placed, and the materiality of the canopy as earthly substance and locus of an otherwise heavenly encounter. Bogdanović has written considerably more than a catalogue or compendium of Byzantine canopies from the earliest Christian example at third-century Dura-Europos in Syria to fifteenth-century Turkey and Greece. The Framing of Sacred Space incorporates a much-needed discussion of the intricate relationship between Byzantine architecture, interior decoration, and the very conception of enlivened, animate space, with divine presence activated and facilitated by the use of the canopy. This monograph should be a standard reference and starting-point for future discussions of spatial archetypes in Byzantium and the medieval world.